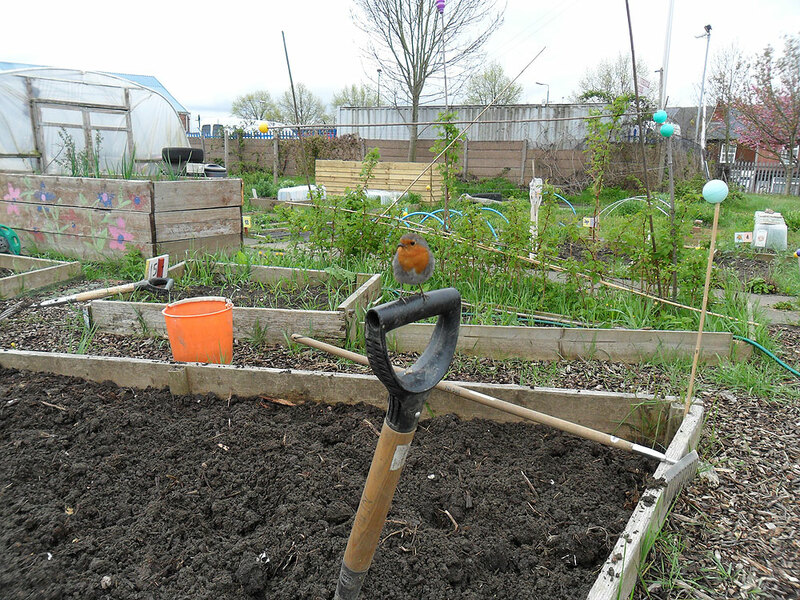 A friendly robin visited us during Saturday's session at the allotment. With hungry chicks to feed, every overturned spade of earth was closely examined for tasty, bite sized morsels to take back to the nest. It is amazing how close proximity these birds come in time of need, and this one had the classic spade handle pose off to a tee. Thanks go to Helen and Paula for the photo and free grubs. Its a while since I've been on site and I'm amazed at the changes and new developments. Alan from the 'Grow and Grow' project has been working on site with different groups and DIG IN volunteers to upgrade and revamp our composting, create new wooden beds for groups and the odd table and chair!He has also been working with volunteers to create bug boxes. The wildflower area will be developed this year and a start has been made to create a wildlife haven near the bee hives.Im really looking forward to recharging our wildlife batteries and making DIG IN an oasis for our wildlife as well as our local people. Despite ghastly weather activity has carried on apace at Dig-in. Wed 11th had volunteers making bee boxes in the polytunnel under guidance from Alan W. Sat 14th sev people including new volunteer Paula came. 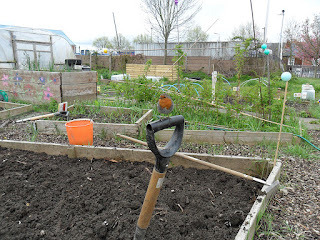 This Wed (18th April) saw 12 people on site sowing seeds in p/tunnel and dashing out to work outside between showers. I'll try to upload the pic but not sure of my IT skills. On Wednesda y 29thMarch, as well as the usual 14 volunteers, lots of people from Tracey's Reachout Project came to celebrate what has been achieved through the project. I'm sure Tracey can tell you all those who came.